Thornton's Fine Jewelry News and Events: Goooo Dawgs! Sic 'em! It is football season once again! After weeks of anticipation, we can all get back to tailgating, football parties, and Saturdays between the hedges! There is nothing quite like the atmosphere that comes with game day in the South: the comradery, good food, and especially the outfits! From toddlers in little uniforms to the more refined pinstripes and Polos, everyone has their favorite way to show off their Bulldawg pride. For us, jewelry is the best way to add a little pizzazz to an outfit and to stand out from the crowd. Thornton's Fine Jewelry has custom made Georgia "G" pendants hand-carved by our own jeweler. They are one of a kind and come in white and yellow gold and in sterling silver. 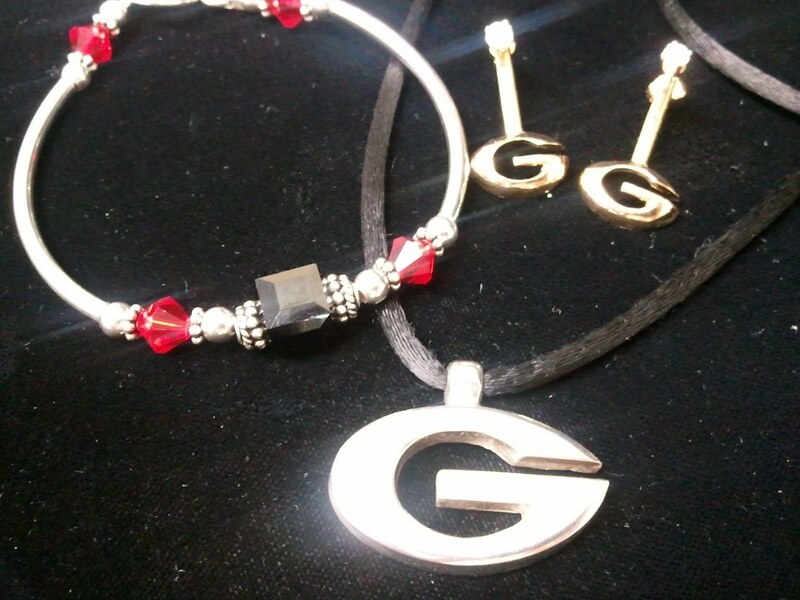 There are also custom "G" earrings and jackets you can add to a pair of earrings you already own. With tons of red & black bracelets, necklaces, and rings you're bound to fall in love with accessories that will make your game day getup your own. check out our selection while it lasts! Go Dawgs! !